The French do love their cigarettes. I think it’s an unfair advantage that smokers get the best outdoor cafe tables, but what can one do? We’ve learned to navigate the crowded cafes and sit at the very edge, and down wind of the heavy smokers. We don’t want to be banked in a cloud of smoke, but we also don’t want to miss out on the charm of the outdoor cafe experience. 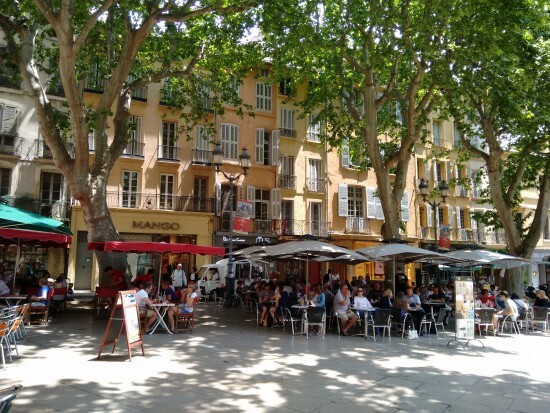 Cafes in Aix en Provence. Oh, it challenged me alright. And I think “semi-seedy” is a bit of an understatement but I’m sure I hope, Marseille has its finer points. Ten minutes into our day in Marseille I was ready to get back on the train but Abi was more open-minded than I, so we hung in for about 3 hours and then we’d I’d had enough. 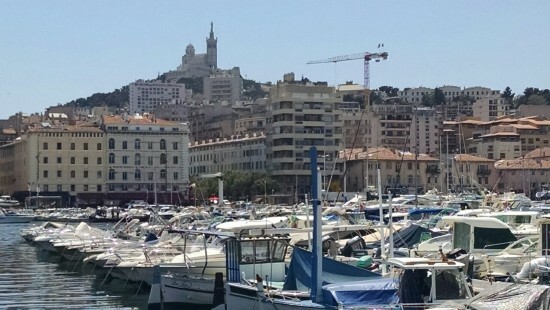 I should say that I’m fairly certain Marseille had so much more to offer, from the waterfront to the steeple on the hill, there was great potential. Unfortunately, as we exited the train station the sights and smells that confronted us set the pace for the day and I couldn’t shake it off. It was so not at all what I was expecting hoping for. After all, my idol, Julia Child fell madly in love with Marseilles when she and her husband, Paul, moved from Paris. I console myself with the notion that Julia fell in love with the city in the 1950’s and I’m guessing it was vastly different in that time. But, maybe not. I wish I could ask her. The inner port in Marseille. Arles, on the other hand is all kinds of fabulous. I could easily hang out in that quintessentially French village for days, meandering up and down the alleys. 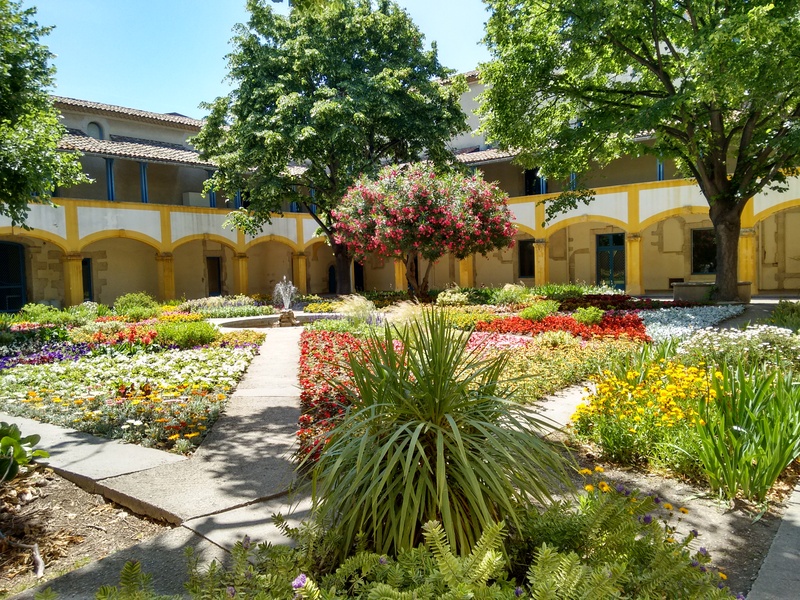 It simply oozed charm and walking in the path of Vincent Van Gogh added the perfect touch to our day trip from Aix en Provence. From the lunch we enjoyed in the town square cafe, to exploring the Roman Amphitheater, to walking along the Rhone River. Our day in Arles was near perfection. Walking in the path of Vincent Van Gogh. The south of France is a veritable playground. 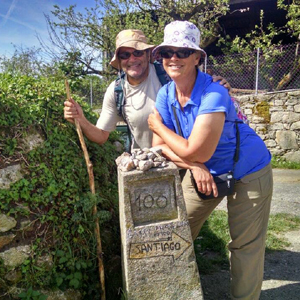 Aix, Arles, Avignon, Orange, the Pont du Gard, and the beautiful Rhone Valley. 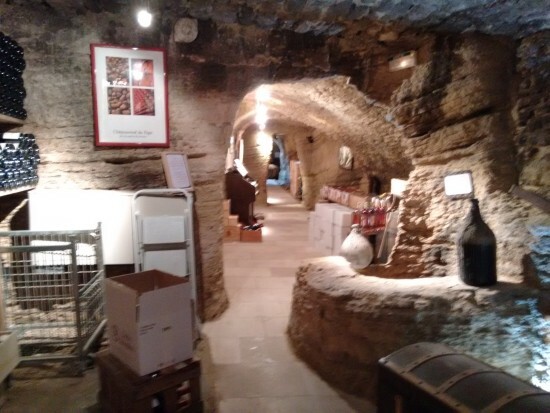 And wine tasting in the 14th century pope’s caves of Chateauneuf-du-Pape is an experience in itself. One of the pope’s caves/cellars. Ten days is not enough, but we took in as much as we possibly could and hopefully, we’ll make it back for 10 days more. 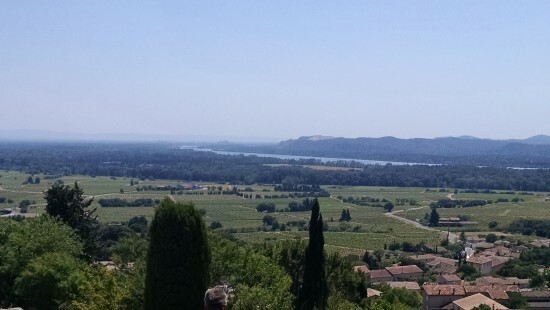 The Rhone River in the distance. Did you make it to Saint-Rémy de Provence? Another haunt of Van Gough. 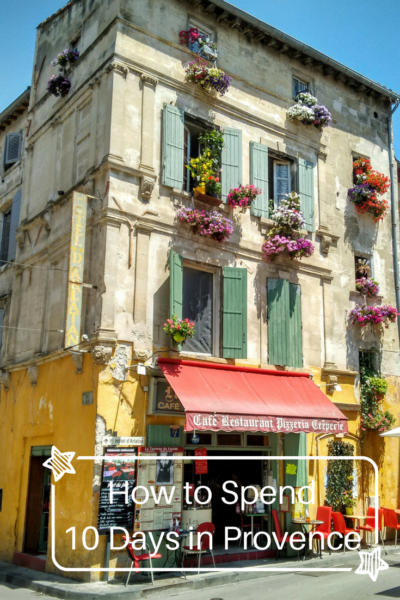 No, we didn’t see Saint-Remy de Provence. It would be fun to have a car and just roam the south of France, wouldn’t it?! How is it that a trip so anticipated actually comes and goes, and for me sometimes it seems it never happened. 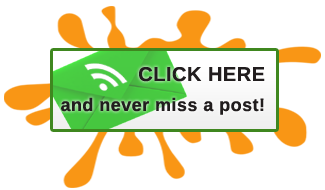 The good thing is you’ve written this blog and will maybe write more or travel more. Whatever. It’s been fun hiking along with you two. What a journey. Thanks so much Sandy, it was good to have you along. I will definitely continue to write, I have stories to tell and we will continue to travel so stay tuned! Headed there myself this Saturday. NOT doing Marseilles. But Julia did love it. Yes, but Julia loved it in the late 1950’s, I suspect it’s changed considerably. Patti indeed it is unfair that the smokers get the best cafe tables, here in the UK they are banned to smoke outside in the rain, fog and cold. I have never been to Provence, but is on my list and I will make it there one day, I love France, the language, the food, the history and culture, like you I could live there. So your trip has come to an end, but I hope that you will be back in Europe soon and you will make it to England next time. Thanks so much for the continued support and friendship, Gilda. We have 2 trips we’d like to take… Italy, Greece and Turkey and Ireland, Scotland, England, so we’ll get there! For some reason the iconic features in France don’t intrigue me. The countryside looks inviting and I’d like to just drive around the backroads and villages. This was an awesome journey you took. You’re a country girl at heart, Gaelyn! Looks like a beautiful end to an incredible trip! We take France for granted because it’s so close to the UK and I forget how beautiful it is; we’ve had a few great holidays there. I hope you did plenty of relaxing, you deserved it after the long walk! PS: Welcome back. Now that we’re within 150 miles or so of each other, I hope we get to meet IRL some time. Thanks! 150 miles is not so far and we’ll be on home turf for a while. 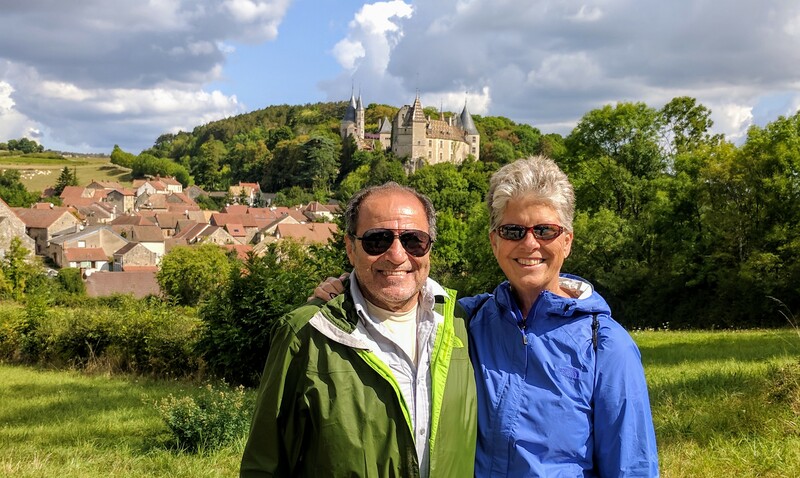 The south of France is wonderful and I wish we had had more time to explore. There is so much pretty countryside, so much history and such charm. It’s just lovely. Go!